Our walking tour of the Forum/Coliseum ended with the heavens literally opening up and pouring down heavy sheets of rain upon us. And there we were under our collective umbrellas trying to listen to the tour guide as he explained how slaves operated the colosseums awning. Looking back now, it was all very surreal. There I was, in the colosseum, shivering under my now broken umbrella, thinking to myself I can’t believe this is happening. 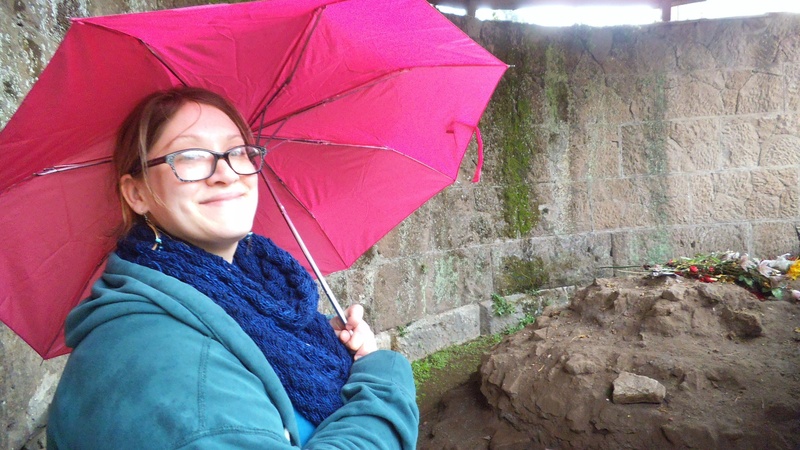 We were standing in the middle of the colosseum in a thunderstorm holding up wiry umbrellas. “Hail, Emperor (Caesar), those who are about to die salute you”. Looking up from under my umbrella I saw that it was my husband Frank who was trying to get the tour guide’s attention. …. he said as we continued to get pummelled with heavy rain pellets. Everyone agreed and we all summarily scattered like rats and ran for shelter. This is the time that I realized how very big the Colosseum was. We were literally in the middle of an arena larger than a football field and it was a long way to the nearest shelter. As soon as we entered the colosseum’s walls and were out of the storm we all began to shake ourselves out like wet little puppies. After catching our breath, we headed towards the stoney stairs which were now packed with throngs of other wet tourists. After finally reaching the exit, we began to make our way back. 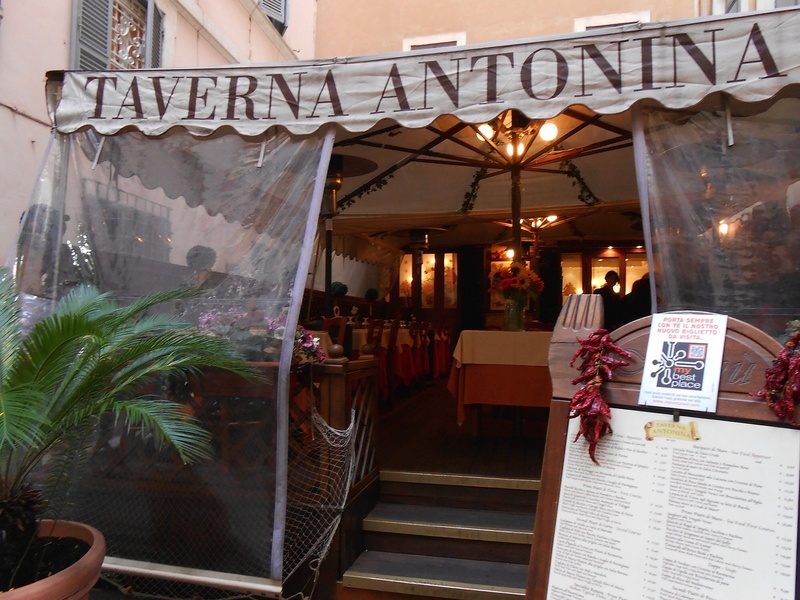 Now between the Colosseum and our hotel was a wonderful little Italian restaurant where we dined on night that we arrived in Rome. By this point the rain had slowed, thankfully. We chose a table outdoors underneath the tent right next to a portable space heater which would help dry us off and warm-up. We ordered large quantities of comfort food and wine and then sat back reflecting on our recent adventure. Is this bird hungry or just happy to be out of the rain? 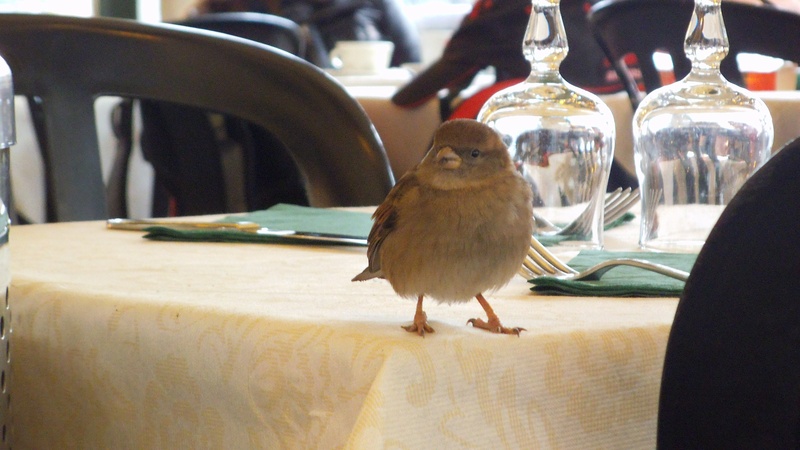 Either way, this curious little bird brought us joy and we immediately forgot how wet and cold we were. ….. Saluting our Roman dreams!